Just after the fire, came the rain. Storm clouds gathered and showers fell bringing a break to a years-long drought that Elijah has prophesied to Ahab, the wicked king of Israel and husband of Jezebel. Ah, yes, Jezebel, a woman of Sidon, a heathen nation on the north border of the Promised Land. This woman had introduced Ahab and Israel to Baal. She was particularly irritated at what God had done through Elijah. She issued an order of execution for God’s prophet. Elijah freaked out, to put it bluntly. He ran away in fear and anxiety. He ran into the wilderness and fell down under a juniper tree and asked for God to take his life. 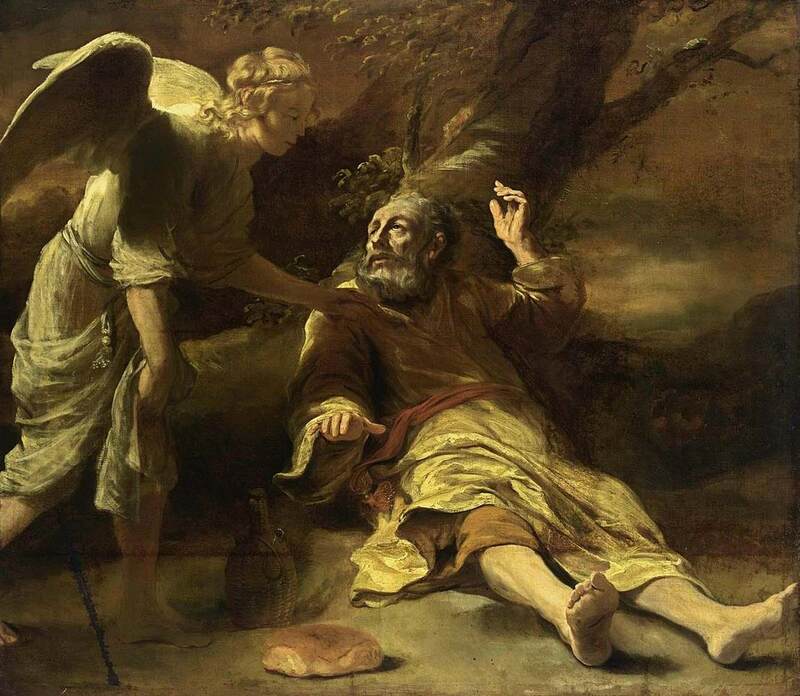 Soon, he was awakened by an angel and told eat and drink. Forty days later he secured his rocky accommodations at Horeb. Elijah may have thought he would now live out his days out of sight from Ahab and Jezebel. God, however, had not cast away His man. The purpose of the Lord is inescapable. Our refusals, our wonderings, our journeys to far countries do not nullify what the Lord has determined to do. “What are you doing here, Elijah?” came the word from the Lord (see 1 Kings 19:9). At last, there was a still, small voice. Just whisper was enough to reveal the presence of the Lord. This story finishes with Elijah being revived in his mission as prophet. And, God would provide a friend and fellow follower, Elisha, who would become his successor. I want to look at this story a different way. There is a lesson here, I think, that God first taught Elijah, and now He wants to teach us. Elijah was called out of the cave. He was to go and to be the still, small voice for God in this world. Proverbs 8:31 says that God rejoices in habitable places on earth and that He delights in the sons of men. That is, the Lord longs to fill us and use us to tell His story, to speak of His great faithfulness to us. Page through the Scriptures and see. In Jonah 1, a reluctant and disobedient prophet was fast asleep among the cargo aboard ship bound for Spain. A strong storm fell upon the boat, and Jonah was awakened by the pagan sailors whose gods were not answering their prayers. Jonah had to speak the truth about himself and the Lord. God used this prophet’s stammering lips to give voice to God’s answer for the storm. “Throw me into the water, and the storm will stop,” Jonah told them. The sailors called him crazy and started rowing more furiously. The storm got worse and so into the water went Jonah. Storm over. Pagan sailors now turned their worship to the true God. Jonah, as we know, wound up in the belly of a fish. But his still, small voice for God stopped the storm. The Lord was in that stormy wind because the Lord was with Jonah. Paul and Silas were wrongfully arrested and shackled in the depths of a dark jail in Philippi. Their feet were in chains, but their tongues were free. The two of them began to sing a hymn unto the Lord. Imagine, these still, small voices glorifying the Lord in that moment of trial. It was probably something of a joyful noise, for Paul relates how his vocal ability was termed contemptible (2 Corinthians 10:10). The walls began shake as God brought an earthquake. He was in this because He was in His men who were in it. Their voices did more than move God to move the earth. The jailer was awakened by the earthquake and purposed to kill himself, for he expected to be held responsible for the escapees. None of the prisoners fled, however. The jailer fell down and said, “Sirs, what must I do to be saved?” Before the night was over, this man and his household were baptized as believers in Jesus. Still, small voices do much for the Lord. Daniel 3 tells us the story of the three Hebrew boys who faced fires with conviction. The great and mighty King Nebuchadnezzar demanded their worship of him and his empire of Babylon. They refused to bow before the idol he had made to his greatness. These still, small voices stood fast for God. They were bound up and tossed into an overheated furnace that consumed any who came near. Soon they were loosed and walking about in fellowship with the Son of God in the fire. He was with them and so He was in the fire. Here, King Nebuchadnezzar had a heart change. This king began to honor the majesty and sovereignty of the one true God. Still, small voices – this is what we are called to be. We are at rest in His grace and mercy. We are people of broken and contrite hearts. He wants us to come out of caves, the cocoons and comfort zones we sometimes make for ourselves. He needs us in the winds, the earthquakes, and the fires of life. Our voice is His Voice when we let Spirit fill our mouths. It is the Father’s good pleasure to give us the Kingdom.